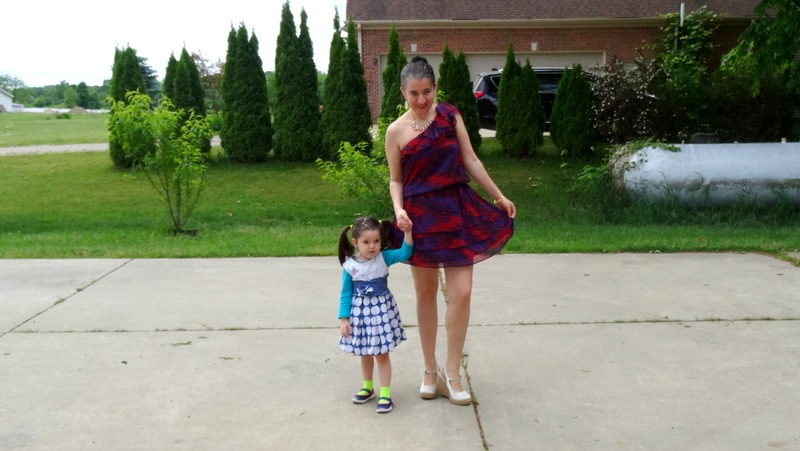 Watercolor One-Shoulder Ruffled Dress and Friday Favorites with Lizzie. TGIF Everyone! 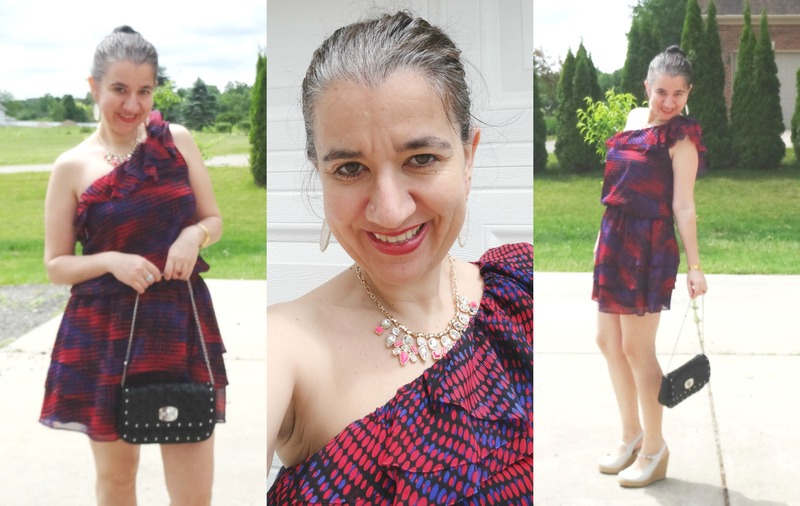 For all of you who stopped by Thursday Moda yesterday (you can still join the linkup, by the way) you saw that I had a on a pretty, ruffle-sleeve, short, bright patterned dress. 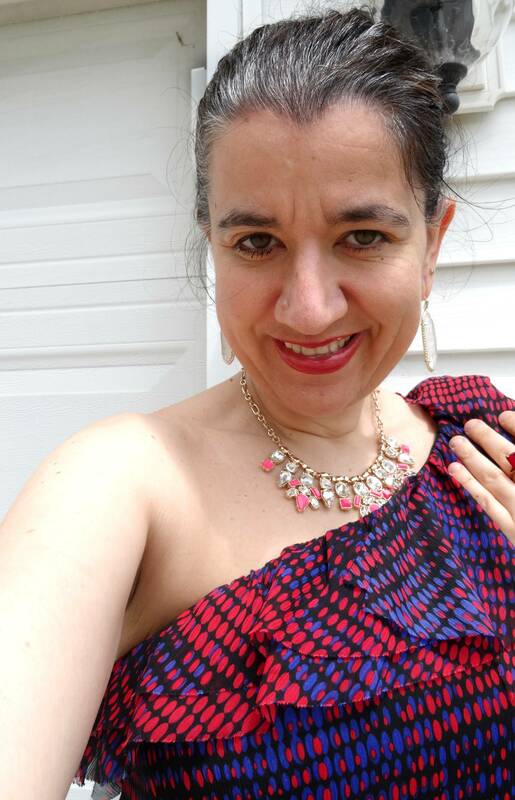 Today I have on another tiered, ruffled, colorful patterned dress. 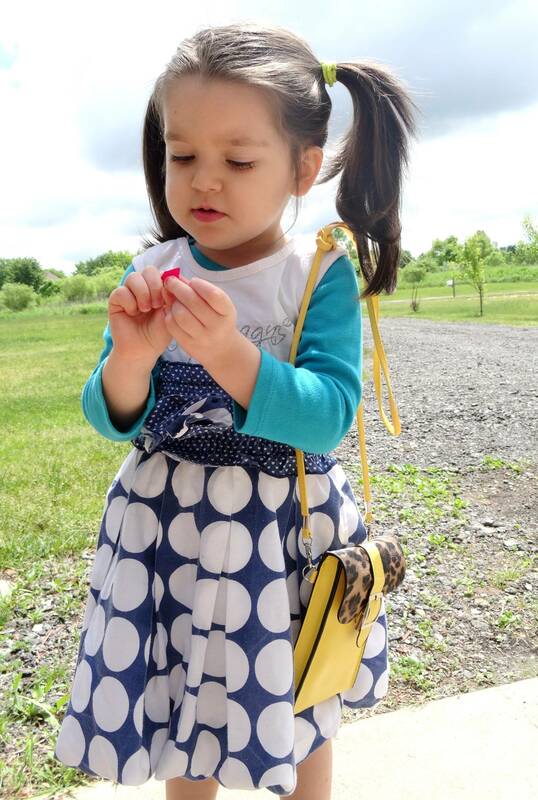 And my daughter Vivian is sharing one of her dresses too. Both of us are bringing you a little early inspiration for a casual but girly 4th of July look. 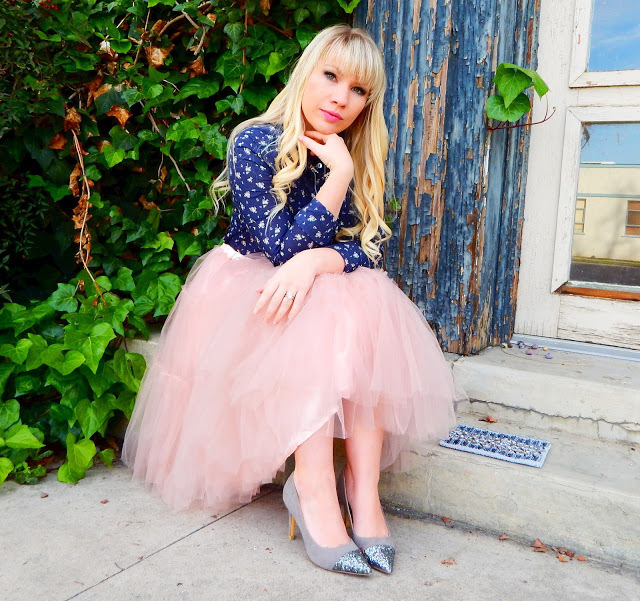 I am also co-hosting the "Friday Favorites" Linkup today with LIZZIE from Lizzie in Lace whose style is adorable full of frills, lace+tulle, flower prints, beautiful dresses and girly skirts. I did all of her dresses and skirts. 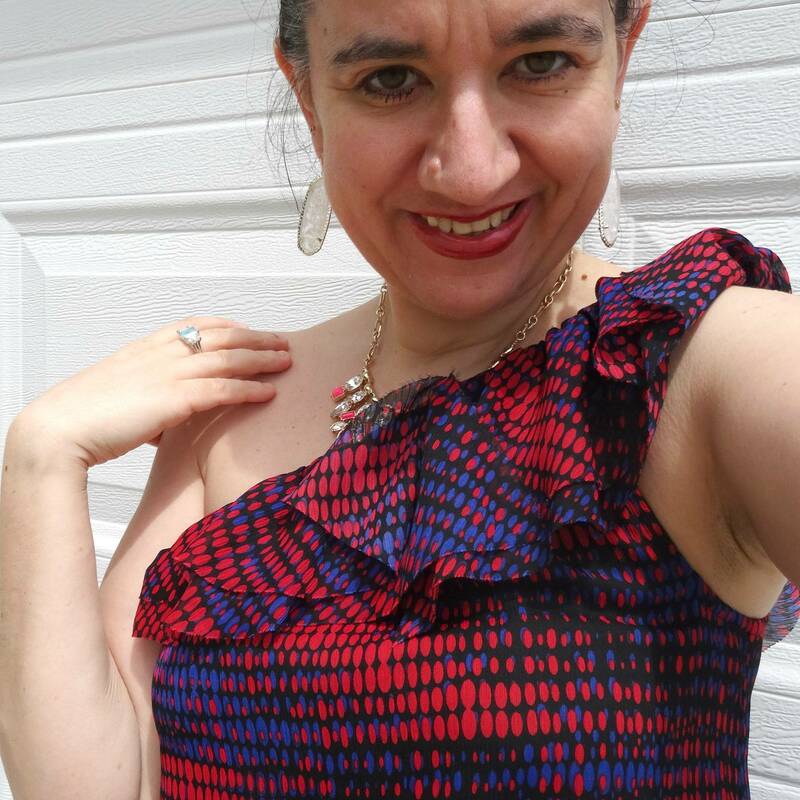 Also, in honor of Lizzie, continuing with the second week of June where I style Bright Dresses, I chose this girly, flirty, ruffled number just for Liz. 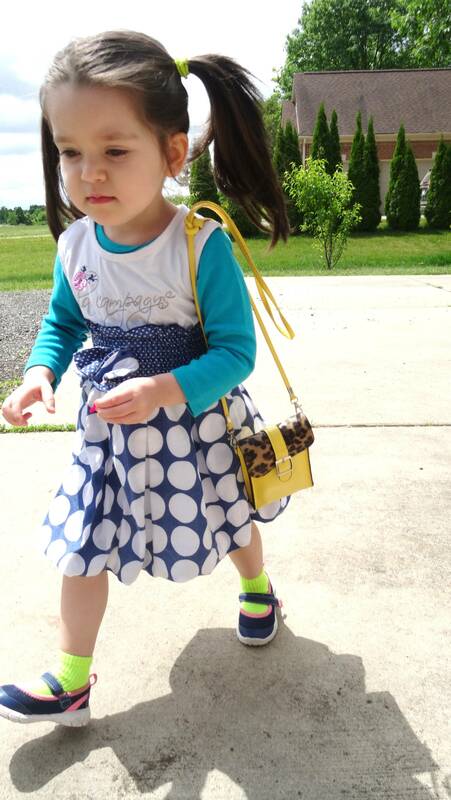 You should stop by her blog today too because I can guarantee you she will have on something gorgeous and adorable! Besides the regular off-shoulder multitude of dresses I have seen in real life, different stores, magazines and lots of bloggers this year, I am starting to see asymmetric or one-shoulder ruffled dresses and tops too. I love the asymmetric off-shoulder look of this fun, flirty little dress which has been in my closet for about 6 years. The background of the dress is black but it is bursting with red and blue oval dots in a slightly watercolor pattern. I paired it with these Satiny Ivory Espadrille Wedges not simply to add the white that was missing from my Red, White+Blue look but because I felt these tall wedges looked so cute paired with the dress. The wedges also match the ivory pearl geo-shaped drop earrings I am wearing. And I am carrying my little Black Quilted Bag which brings out the black from the dress. 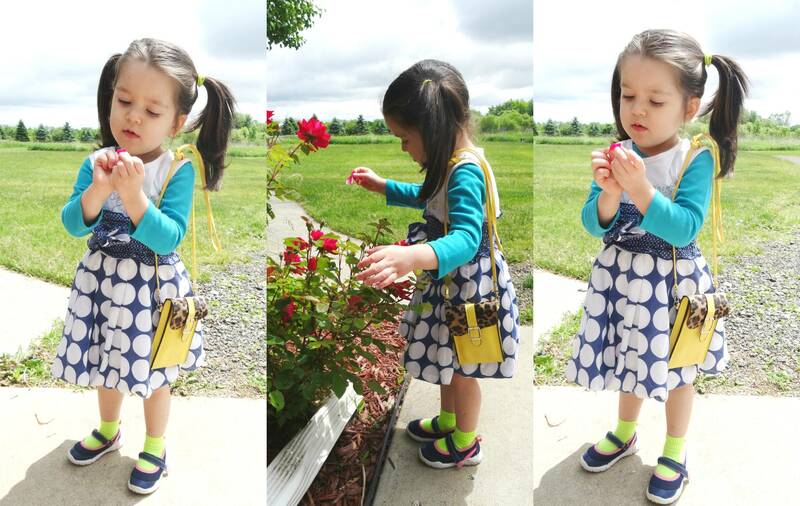 Vivian was busy smelling the roses (literally) the day of this photo-shoot. 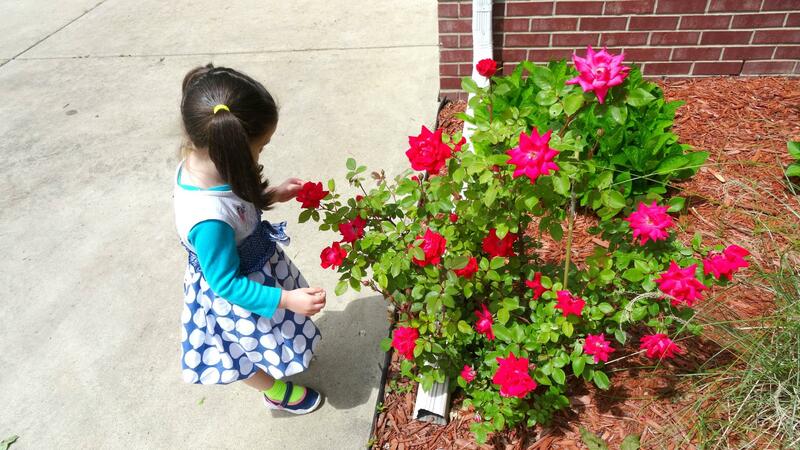 She was fascinated by the red and pink roses that have bloomed in our yard and she even broke off a couple of petals. 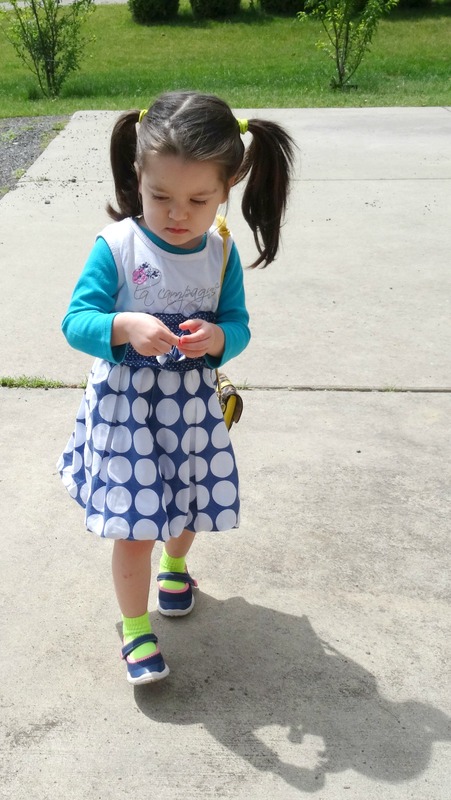 She is wearing a fun Bubble-Skirted Dress which features large Polka Dots on the Skirt and tiny Polka Dots on the smocked waist-line. 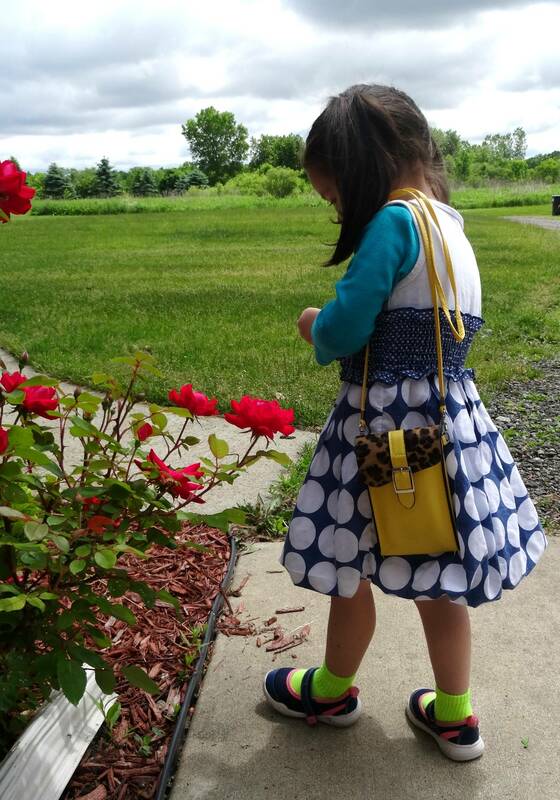 She wanted to carry the yellow+leopard camera bag as her purse in order to match her cute Neon Yellow Socks and I had to put some neon yellow hair elastics on her little pig-tails, too. So, how do you like our Dresses and our subtle take on Casual but Girly Patriotic Outfits to wear while you are invited to a BBQ on the 4th of July?! Do you happen to own a one-shoulder ruffled dress yourself? 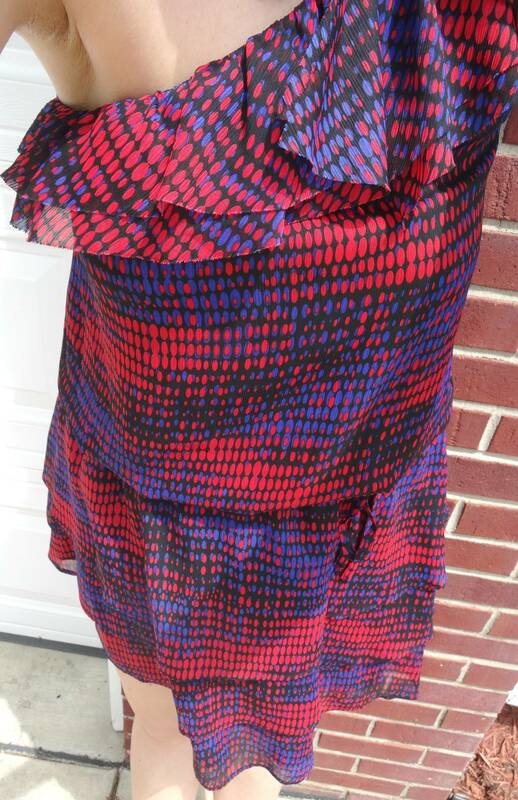 Red/Black/Blue Watercolor Dotted One-Shoulder Ruffled Dress: The Limited (similar in Cobalt, Great Deal), (gorgeous asymmetric option in floral, my Favorite), (dressy LBD option w/ pop of blue, my Favorite), (pretty cocktail colorblocked option, Splurge). Ivory Satin Mary Jane Slingback Espadrille Wedges: Old Navy (similar, Steal), (similar, Great Deal, my Favorite), (similar, small Splurge, love these). 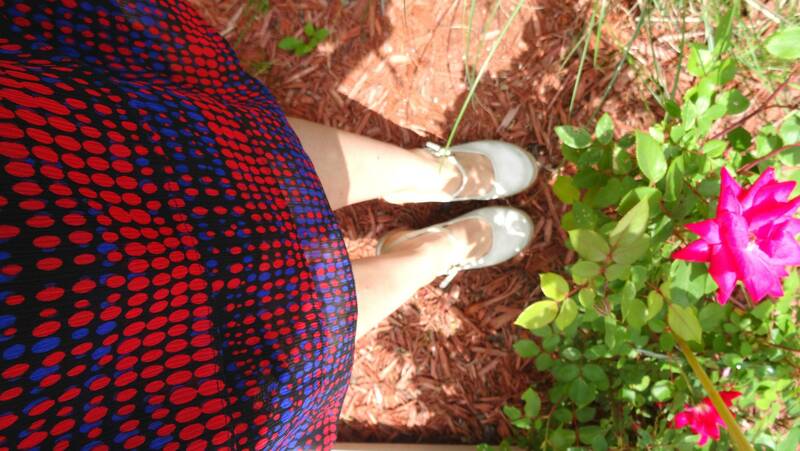 Blue+White Polka Dot Dress w/ Bubble Skirt & Graphic Tank on top: Hand me down from a Friend of mine. Teal, Long-Sleeve Undershirt: Wal Mart. Neon Yellow Socks: Wal Mart. Yellow+Leopard Mini Crossbody Bag/Camera Bag: Purchased in NYC. Navy+Pink Canvas Mary Jane Ballet Flats: Carter's. Jaymie, Jennie, Jolynne, Karli, Kelly, Lauren, Lisa, Melissa with Sheree + Rachel, Michelle, Monica, Nancy, Osy, Rachel, Rosie, Sheela, Shelbee, Tara (Socialite), Tiffany, Veronica, Vicki, Whitney Nic, The Wardrobe Stylist and Zhenya. Hi ladies! I'm Liz (or Lizzie) from Lizzie in Lace! I'm a substitute teacher by day, private guitar instructor and business owner by night and full-time fashionista! My style is a mix of romantic, eclectic and bohemian. I have a strong love for ruffles, sequins, lace and all things "pretty." Welcome to my blog and welcome to the link up! 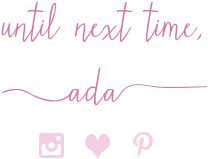 You can follow me by Instagram, Pinterest, and Bloglovin'. 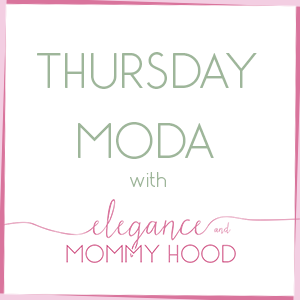 This week I have Ada from Elegance and Mommyhood joining me as co-host! Hi. 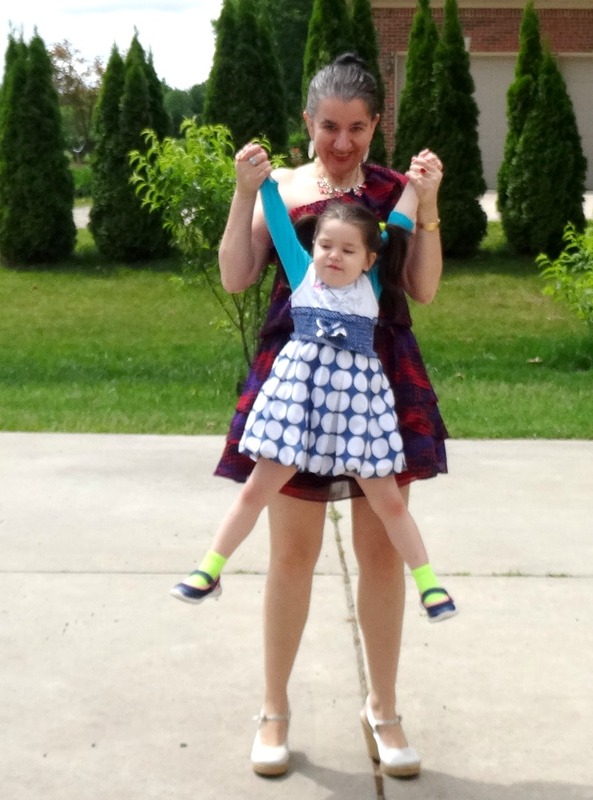 I am Ada, a mom in her mid thirties blogging from the Midwest and sharing my personal style as well as the cute outfits I put together for my 3-year old daughter Vivian. As a mom I don't have too much time or too much money to spend on what I wear but I still look put-together and elegant while shopping on a budget. I want to thank Lizzie for having me as her guest co-host today. I adore her girly, flirty style and all her dresses as I am a dress fan myself (as a matter of fact I am styling a dress each day of June). 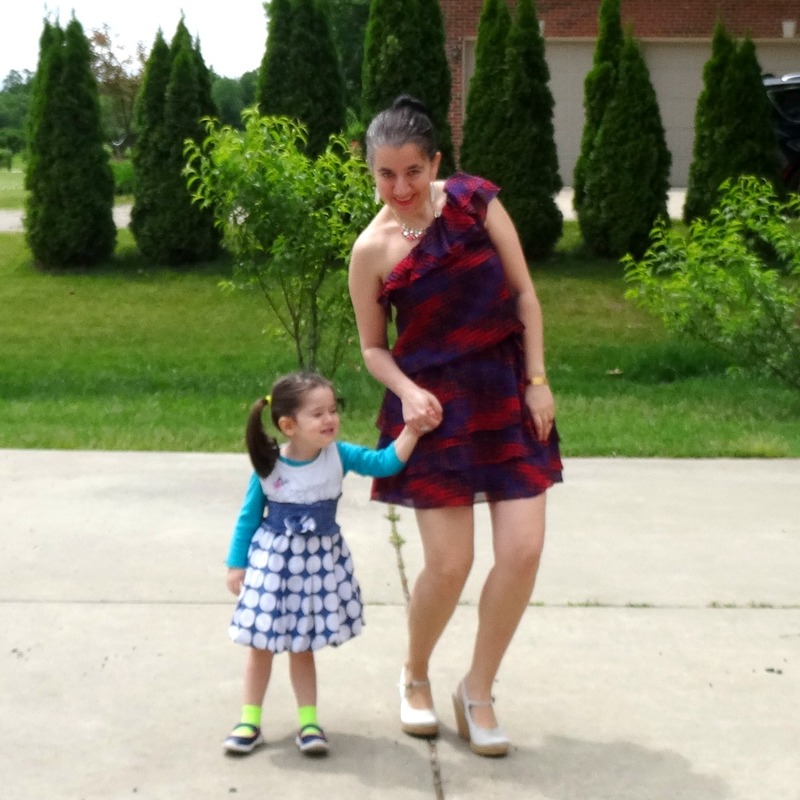 I welcome you to follow and visit my blog Elegance and Mommyhood. And I also run my own style linkup on Thursdays. Thank you for stopping by." You can follow her on Bloglovin, Pinterest and Instagram!